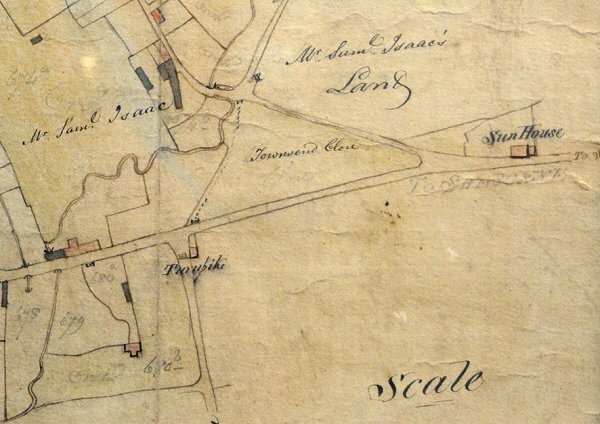 Originally known as Penfield House or Penn Field, since it was built in the corner of the field called Pen Field, Osborne House was built in the Regency style but slightly later, around 1830 (it is shown on Watts' map of 1831). 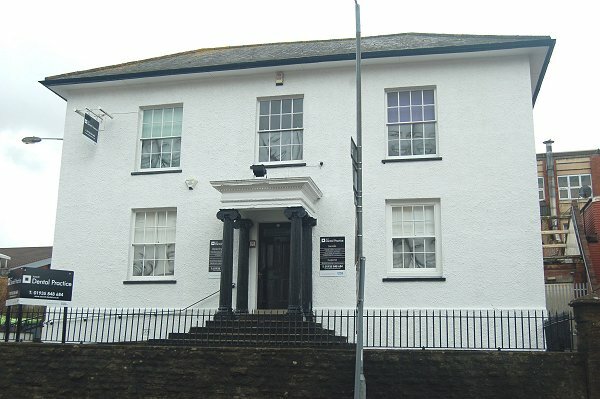 It is of two storeys and three bays with a roughcast render finish under a hipped Welsh slated roof with wide soffits. 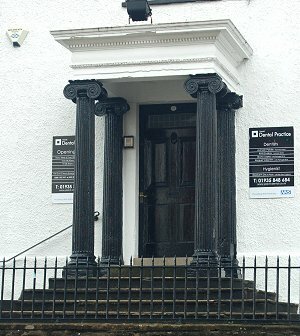 It has a fine central projecting porch, set on five steps, with fluted Ionic columns and attached columns supporting a full entablature. There is a high stone wall to the front boundary capped by nineteenth century railings, with two pairs of simple gate piers with moulded caps, although the gates are missing. As seen from the map below, Osborne House originally had extensive grounds but much of these were sold off in the mid-1890's to Aplin & Barrett for the construction of their new cheese and dairy products factory. 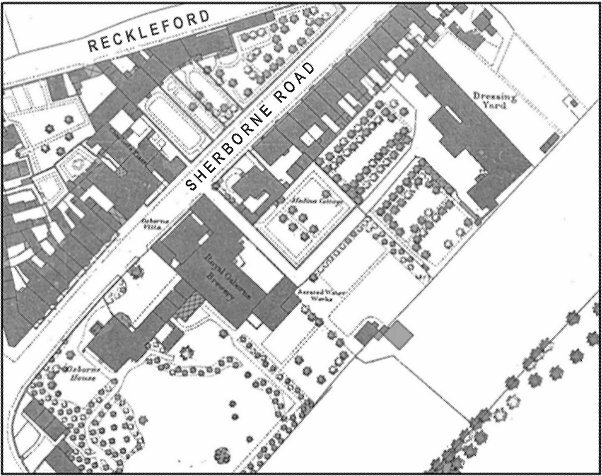 Of the owners of Osborne House it would appear that the first was glove manufacturer Charles Fone, as shown on Watts' map of 1831 when the house was newly-built. During Charles Fone's occupancy it was known as Penfield House and is listed as such in the 1841 census at which time Charles was living there with his wife Mary, six children and a female servant. Charles Fone moved to Middle Street and in the 1851 census Osborne House was occupied by 51-year old Timothy Huffam of Peckham, Surrey who listed his occupation as brewer. Also living with him was his wife, Catherine, their four sons and a domestic servant. By 1871 Osborne House was owned by Earle Vincent, owner of the Royal Osborne Brewery which was located alongside Osborne House. In the 1871 census he was listed as a brewer and a widower aged 33, living with his two young daughters Sophia aged 6 and Henrietta aged 4. Also living with him was his younger sister Augusta, who presumably looked after his daughters, a cook and a housemaid. Earle Vincent died in the summer of 1893 aged 55 and on 23 November 1894 Emma Vincent, his second wife and widow and Sophia Fowle Vincent, his daughter by his first wife, conveyed to John Vincent of Yeovil, an outfitter, "a messuage known as Osborne House". On 8 April 1895 John Vincent conveyed to Jonathan Drew Knight of Yeovil, brewer, a piece of land on London Road, which adjoined The Royal Osborne Brewery and Osborne House and on 1 August 1895 John Vincent conveyed Osborne House to coachbuilder John Henry Boll of Yeovil, and on 3 August 1895 John Henry Boll mortgaged the property back to him. On 20 February 1896 John Henry Boll conveyed to cheese factors James Shorland Aplin and William Henry Barrett (Aplin & Barrett), a piece of land, formerly part of the garden of Osborne House. 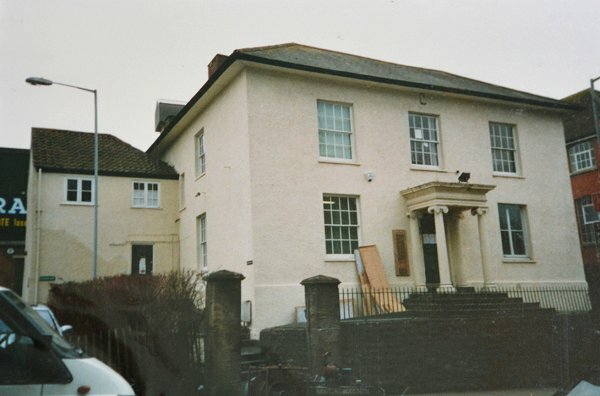 On 31 December 1896 Emma and Sophia Vincent conveyed to Aplin and Barrett, a parcel of land in Newton Road, Yeovil as a right of way. On 12 Nov 1897 draper Norman Buchanan of Yeovil, mortgaged Osborne House to spinster Mary Jane Hayward of Wollaston Terrace, Dorchester, Dorset. On 4 September 1905 Buchanan mortgaged Osborne House to ironmonger Thomas Cecil Laver of Yeovil and on 13 August 1912 Walter Herbert Baxter of Sherborne, Dorset, Esq. 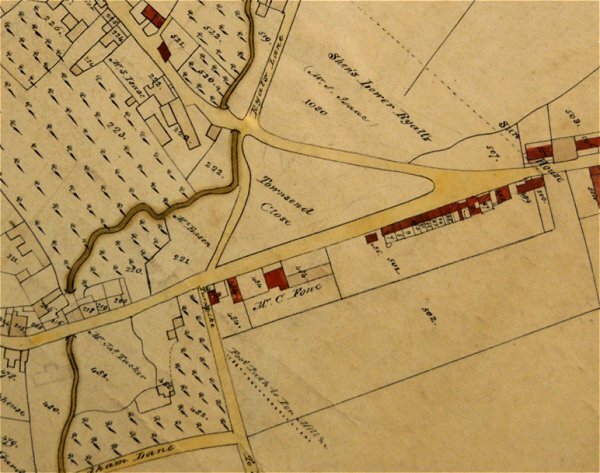 conveyed to Buchanan, a parcel of land fronting onto Sherborne Road, with its stables and coach houses. On 14 August 1912 Norman Buchanan mortgaged this land to Edmund Damon and William Willis Henley of Yeovil, gent. In 1916 Buchanan, Yeovil's mayor at the time, died at home on New Year's Eve 1916 by falling down the stairs! 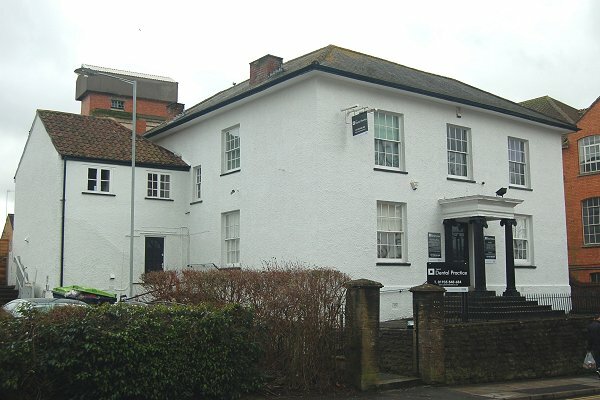 On 7 July 1919 Buchanan's widow, Emily Rose, conveyed Osborne House to Aplin and Barrett and The West Counties Creameries Ltd.
Osborne House is now a dental surgery while the site of the brewery is now the adjacent car park. E Watts' map of Yeovil of 1806 shows Townsend Close at centre, completely devoid of buildings. The same area on E Watts' map of 1831 showing the build-up of properties along the southern side of Townsend including Osborne House, albeit not named as such. At this time it was known as Penfield House and was the property of Charles Fone. Map based on the 1886 Ordnance Survey. Osborne House and its extensive grounds take up the whole of the lover left of the map. 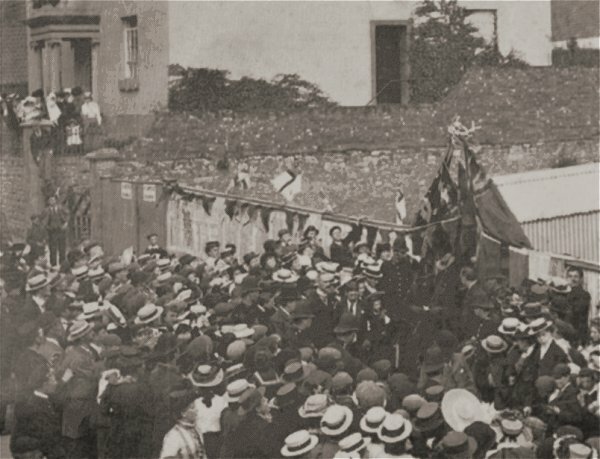 King Litunga Lewanika of Barotseland (in silk top hat, just below and slightly to the left of the flags) performs the foundation ceremony of the new Western Gazette building in June 1902. At the top of the photograph is Osborne House, with a small crowd by the front door and the flank of the house running off to the right. Osborne House, right of centre flanked by Sparrow's garage and the Western Gazette building, in its streetscape of the 1960s. 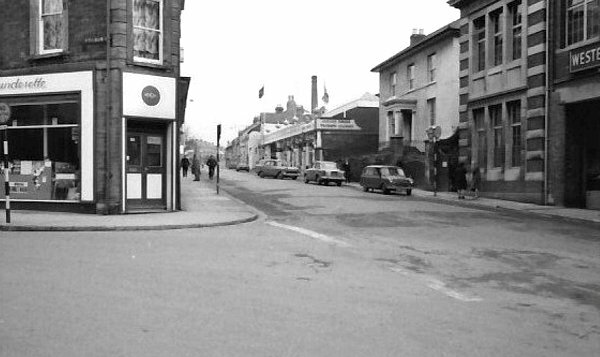 At left is Wyndham Street. 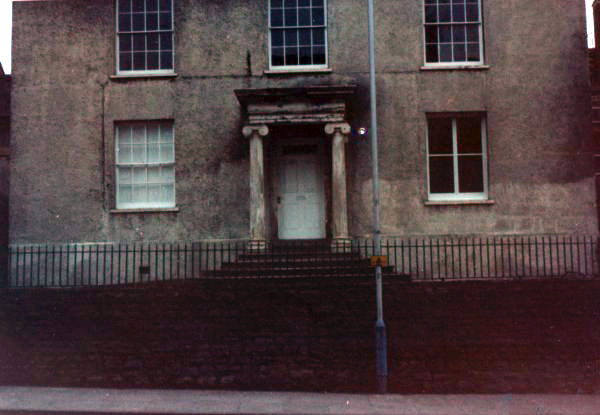 .... and photographed in the mid-1980s. Osborne House photographed in the 1990s. 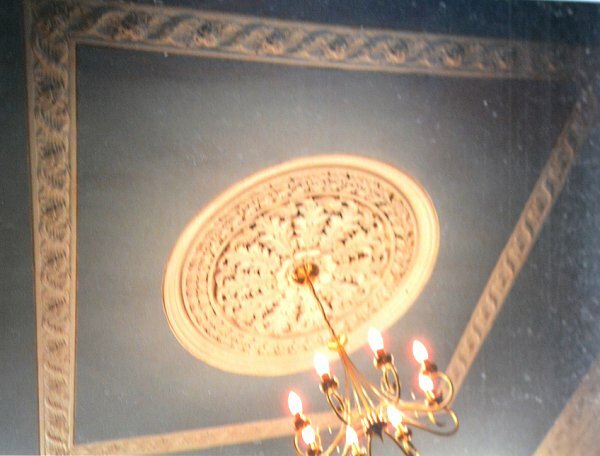 Ornate ceiling plasterwork, Osborne House, photographed in the 1990s. 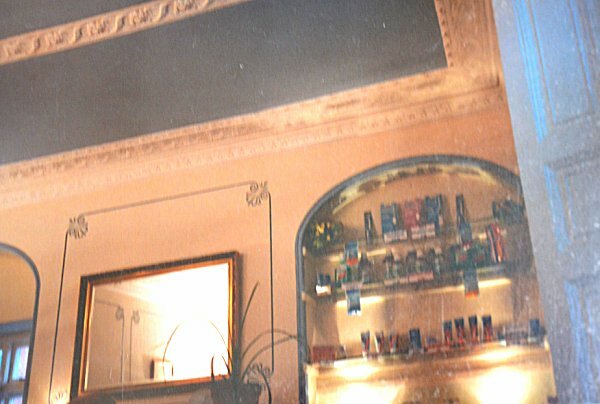 Decorative plasterwork and niches, Osborne House, photographed in the 1990s. The front elevation displays the perfect Regency styling of Osborne House. Osborne House, showing the nineteenth century railings with one of the pair of simple gate piers with moulded caps.